Hardwearing and UV resistant coating for decking. Resistant to algae and mould growth. Good adhesion. 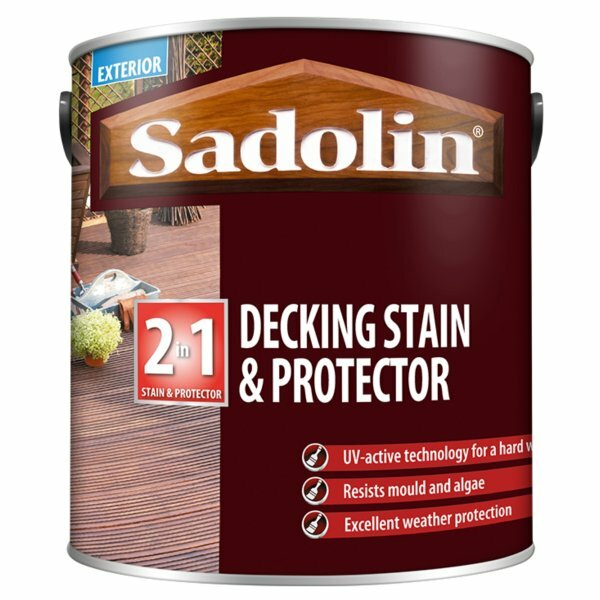 Sadolin Decking Stain and Protector is a 2 in 1 formulation offering a water-based woodstain and advanced UV protection in one product.It is a hardwearing finish that will resist algae and mould growth. Application is by brush with coverage up to 15sq/m per litre. Recoatable between 4-6 hours. We recommend a trial application before you start. The final colour will depend on the original colour, condition and texture of the timber, as well as the number of coats applied. New or Bare Wood: Ensure surfaces to be stained are clean and dry. Wash surfaces with water and a mild detergent and allow to dry. Lightly sand if necessary or scrub with a non-metallic stiff bristle brush in the direction of the grain to remove any loose particles. If excessive weathering has taken place, any grey denatured timber should be sanded back to a clean sound surface. Inadequate surface preparation will lead to poor coating performance. For best results, decking boards should be coated all round prior to fixing. Remove any grease and wipe any resinous areas and knots with a cloth dampened with methylated spirits. Previously Painted or Varnished Surfaces: Sand back to bare timber and treat as new wood. Timber should be suitable for use as decking. Not suitable for use over water-repellent preservative pre-treatments, unless suitably weathered. Stir well before and during application. Do not apply at temperatures below 8°C or above 25°C, in damp conditions or when rain is imminent. Water-based products are greatly affected by low temperature and high humidity, which in extreme cases may lead to poor coating performance. For best results always apply to dry timber. Allow 3 days after washing down or rainfall before commencing application. Apply the first coat liberally by brush ensuring complete saturation of the timber. Avoid over brushing as this will result in brush marks. For best results use a synthetic bristle brush. Apply up to 3 coats depending on the finish required. Allow 7 days for optimum durability to be achieved. Special attention should be taken to ensure freshly sawn ends of decking boards are thoroughly treated with a suitable preservative. Due to the high levels of weathering and abrasion that decks are exposed to, maintenance may be required as frequently as every year. Clean the surface as above and apply 1-2 coats. At low temperatures or high humidity, drying times may be extended. Only purchase sufficient material for the job. Brushes and tools can be cleaned in warm soapy water. Reseal can after use and protect from frost.